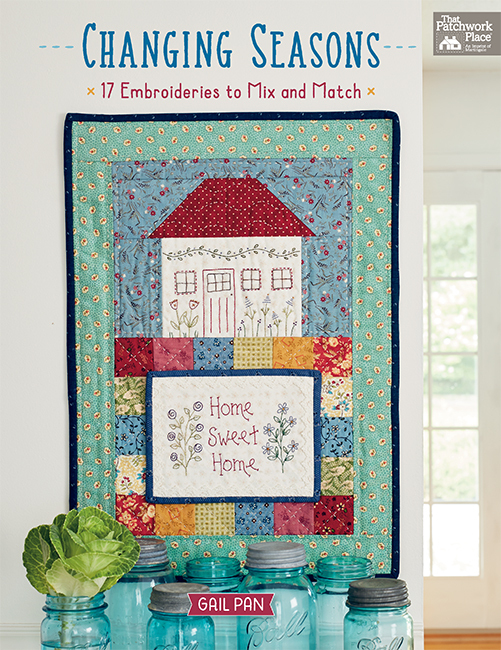 Did you miss the Splendid Sampler Sew-Along? Are you still working on your blocks? Do you want to make your blocks all over again? 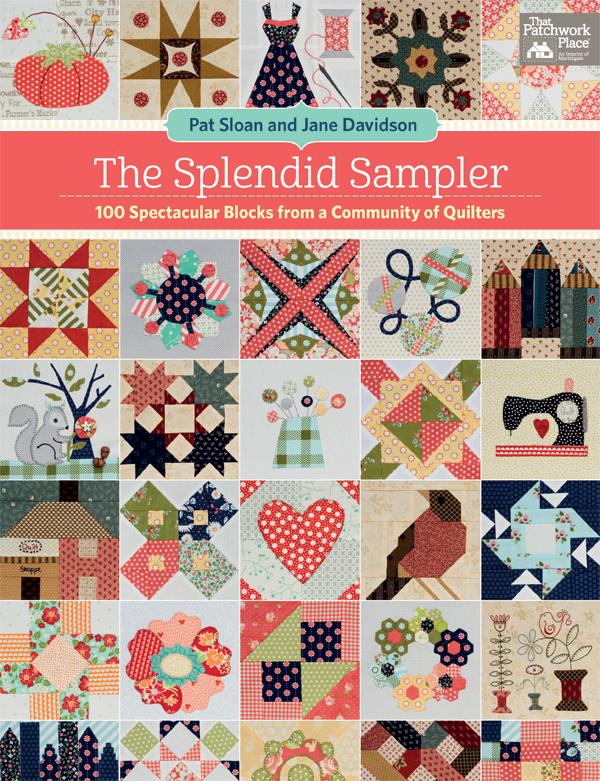 Tune up your machine and start sorting your fabrics—The Splendid Sampler authors Pat Sloan and Jane Davidson are starting an all-new Splendid Sampler Sew-Along this Thursday—meaning TODAY! And this time, they’re sewing from the book! Pat and Jane have switched up the order of the blocks from last year, so you’ll have a fresh surprise each week. Sometimes they’ll assign one block per week, sometimes two, so the pace is a little more relaxed. And this time, you’ll have the benefit of following along in the book—no more printers or page protectors to fuss with! Along with Pat, Jane, and Aurifil, we’re helping to kick off the new sew-along with some fun giveaways! 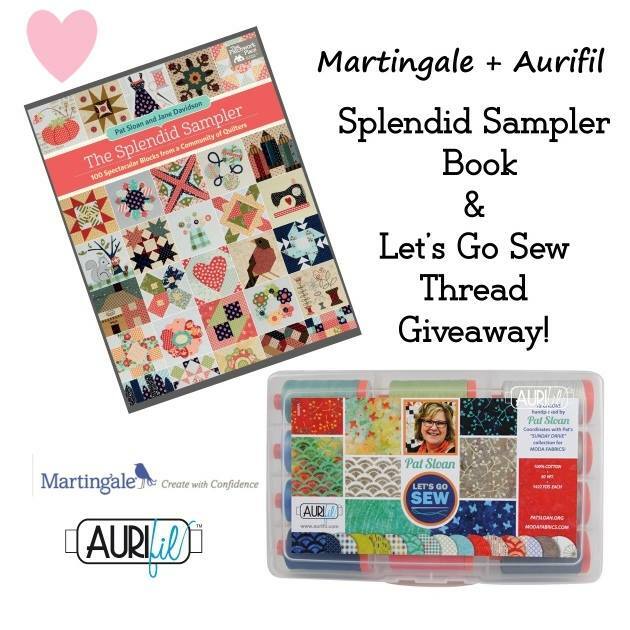 Be sure to visit all three links below and enter for your chance to win The Splendid Sampler PLUS a designer Aurifil thread box from Pat or Jane! 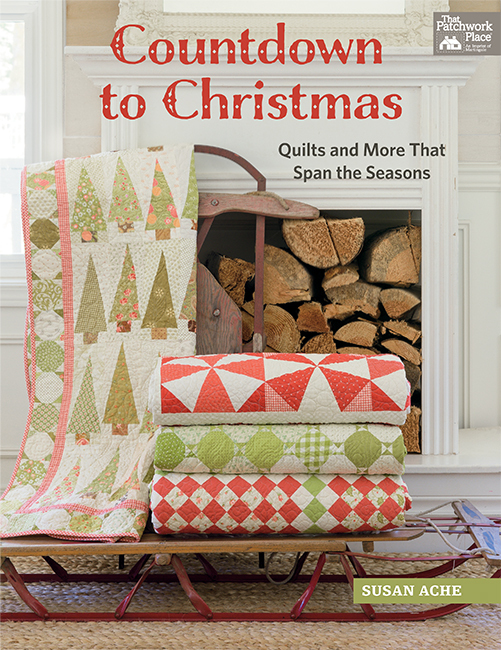 Order your book here and download the eBook instantly for free; then head on over to the Splendid Sampler Sew-Along Facebook group and join in the fun! Is your Splendid Sampler project completed, somewhere along the way, or just a twinkle in your eye? Tell us in the comments! I’m just starting with a dear friend who’s new to quilting. I’m super excited to be doing it with her and hoping we can stick it out to the end! I have 50 blocks complete from the first Splendid Sampler challenge and am happily looking forward to going forward with the next 50 to complete my SS quilt. Thanks for renewing the excitement this project initiates and thanks for the chance to win a giveaway! Just a twinkle in my eye. Have the book and so excited to start. Thanks ladies for doing this. Haven’t started yet but looking forward to getting in on the fun. I’m looking forward to actually getting some blocks sewn! I saved them all as they came out last year, but did not sew one. I’m a teacher, and school is almost over so summer quilting, here I come! My Splendid Sampler is a work in progress, I have a lovely short stack done and many cut out ready for the sewing machine. It has been a splendid journey! My Splendid Sampler is completed, but I am really tempted to start another. I am somewhere along the way. Definitely in the "got stalled" crowd. Hope to get going again with this second go ’round! I want to get started on this sew along! My Splendid journey is just a twinkle in my eye. It is on my "to do" list. Family projects alway come before MY projects. Have some of the Splendid Sampler blocks done…..Would love to win the book. It would inspire me to continue with my blocks. Many of them are cut out ready to sew. I finished a quilt top with 130 blocks from last year’s quilt along. I have purchased the kindle version and starting the journey again with a sewing buddy. You can’t get too much of a good thing. Thanks. My project is still a twinkle in my eye–I have good intentions though. I bought the book the last time you guys blogged about it (I guess when it finally came out recently?) and haven’t started sewing from it yet; this is the perfect inspiration to take it from a "twinkle in my eye" to "project completed"! Thank you for the information! Sounds like fun!! My Splendid Sampler is nearing completion, just a few more blocks to make. Mine is somewhere along the way, as I have so many tops but never get them quilted. I wanted to start this when I first joined Pat’s site, happy to see it is coming around again! Hope to participate this time!! I am making a red work quilt similar to the sample on your e-mail. I am half finished the machine quilting. Loved the blocks and they were fun and easy to do. I liked the combo of machine, appliqué, and hand embroidery. I was in the process of moving last time. I think I might join in this go round. Blocks and a fabric pile are my small accomplishment sew far, will be fun to start again and learn more about colors construction and the big path to getting done, Thanks for fun! My Splendid Sampler is just a twinkle in my eye. The is a wonderful opportunity to try so many different blocks but also a bit intimidating. 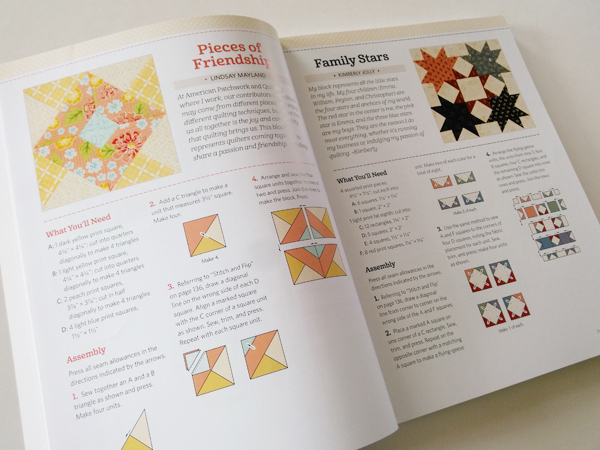 A sew-along using the book with tips from the authors sounds like the best idea! Just a twinkle, I am afraid. But it is beckoning me. I have a retreat next week and then I will be pressing full speed ahead with the Splendid Sampler. Thank you for the giveaway! i am doing the applique blocks in wool with the blanket stitch done by hand using aurifil 12 weight. I’m afraid it’s just a twinkle at this point, but it does look fresh & invites me to make it! It’s a twinkle in my eye. I have the patterns, now just have to find the time. It’s somewhere along the way. I’ve started and make the first 25 blocks and then stopped. Perhaps this is the kick I need to finish it. Sadly, it’s just a twinkle in your eye. It’s still a twinkle in my eye – but I certainly have the scraps to get going! Just a twinkle in my eye that I’d love to bring to fruition! I have just begun my journey. Each block is a masterpiece. I love that each block is so unique Thank you for publishing this fun project, Martingale. And thank toy Jane and Pat for helping inspire me to make my first "sampler". Haven’t started yet so I guess it’s a twinkle in my eye! My Splendid Sampler is about halfway finished. I have completed 60 some blocks not in any order, just the ones that I enjoyed at the time I was free. I have 20 -30 more cut out and ready to sew. I may start over with a new color way since mu original is very scrappy. I completed most of the blocks. This weekend I will start assembling the top. So excited!! Missed out on it last time, so I’m really excited for this go-around. What a great combo give away!! Just a twinkle – but I have the book and my fabric. Time to start! I’m still thinking about it, but would like to do it later. A twinkle in my eye. I look @ Facebook and see all the wonderful finishes from last year and say to myself " I should be making one of these". LOOKING FORWARD TO THIS PROJECT AND ALL THE FUN AND LEARNING! Just a twinkle in my eye, but looking forward to the fun! I’m sure it’s just a twinkle in my eye!! I’m just starting. I’m very excited to have the opportunity to enjoy this quilt along with everyone. I AM ABOUT HALF DONE WITH MY BLOCKS. THERE ARE A FEW I WOULD LIKE TO REDO AT SOME POINT. BUT I AM LEARNING ALOT ALONG THE WAY. It’s just a twinkle. What a marvelous idea this is. It’s barely along the way as I made just a few. I’m afraid it is just "a twinkle in my eye". But, I do love samplers. Just starting and very excited. Just a twinkle in my eye! Too many ideas and not enough time! Its just a twinkle in my eye but they would be perfect for spring. Slightly more than a twinkle… I started with the idea that I could manage two small blocks per week, but after completing seven blocks, life stepped in and the project was put on pause. So, now that life has settled a bit (fingers crossed! ), I’ve been awaiting the start of the new sew-along! I did try to keep up the first time around but did not finish. Going to finish it this time! I have many blocks to go! I had good intentions last year but not enough time. Seeing many lovely finished quilts has inspired me to make more blocks. It’s just a twinkle in my eye. I’ve always wanted to make a sampler quilt, and this one has Jane’s and Pat’s delightful design style all over it. It’s a dream, I definitely have the fabric to do it. It would be nice to have all the info in one book. Just a "twinkle in my eye" so far, but certainly another wish for the list!! Missed the first round, would love to join the party now! It is just a twinkle in my eye. Waiting for vacation in a few weeks to spend some quality time quilting. The Splendid Summer Sampler is just a twinkle in my eye. So many quilts; so little time! It’s somewhere along the way. I have a couple blocks done but had so many other obligations at the time that I had to stop. I’m ready to do this now! Just a twinkle in my eye….. I love all the blocks my friend completed and really want to get this project going. All I need is the book (and the time)! Twinkle, twinkle…. I have other projects I must complete for gift-giving deadlines so this ‘just for me’ quilt must wait until 2018. My original (1st time around) Splendid Sampler is somewhere between a twinkle in the eye and somewhere along the way. All the patterns are printed, and in plastic page protectors, fabric bought and or gathered from my stash, and there it sits! So let the fun begin, this time a quilt will be made!!! I love the book, quilt project but it’s just a twinkle of maybes. Mine is on the way. Maybe I can keep up this time around. …A twinkle in my eyes…and a desire in my heart … to learn new techniques and use up stash fabrics to make room for MORE! Thank you. I finished my splendid sampler. It was one of the most fun quilting projects I have completed. It is still a twinkle in my eye. I need a project. This might be just the thing! looks so inviting and fun, but oh I have so many projects in progress at the time. Wishful thinking. It’s just a twinkle in my eye but I love sampler quilts because I get tired of making the same block. I started but as they say, life happened I am so glad to be able to start again! I’m in the middle of a project right now (using Aurifil threads), but this does look like lots of fun. My quilt club might be interested too. I started and completed only the 1st heart block – then life got in the way with the demands of a continuing chronic illness. It was just too big a commitment for me, but I sure enjoyed watching the products from my fellow quilters around the world! Can’t wait to start the journey with all of you. May new friends be found by everyone. Quilt On! Just a twinkle but I love samplers so this is a project I will want to start soon. A new project for me. I loved seeing all the new blocks each week!! Right now it is just a twinkle in my eye! I downloaded all of the patterns, but haven’t started yet. I hope to start soon. It’s still a twinkle in my eye. I want to make it and will in time! I haven’t started yet. I’m trying to get a few projects completed . I am afraid it is just a twinkle in my eye at this point because I am working on some quilts with deadlines. But I do want to make it after theses are done. Would love to make this sampler. I have done others but this one looks great! Just a twinkle in my eye! But I’d love to get started! It looks like a beautiful book. I have made about 70, then life got in the way. I will catch up in this round. I have completed 35 blocks & am looking forward to finishing the quilt! Since taking Bonnie Hunter’s class last year, I’ve been looking for all sorts of ways to use up my scraps. I missed the first Splendid Sampler, but this time I’m definitely IN! I have started but want the second go around to finish! That is my goal, to finish the blocks this go around! So far it’s a twinkle in my eye, but I am trying to finish other projects first. Hate having too many projects unfinished, at least get the top done before I start another one. I love Pat’s patterns and follow several of her block of the moths. I would like to try a sampler and hopefully my stash may decrease a bit…in my dreams…it multiplies when you start to use it. I’m working on sashing and putting them together. However, I may have to remake a few (or more) because they are not quite the right size. Darn that 1/4″ seam! I got 50 blocks, including a few bonus blocks, done. 25 per side for a small reversible wall hanging. One side is sashed, but not the other. I started another pattern for a wall hanging before I was finished. I will try to start again. I haven’t started it yet, but I loved all of the different techniques that were included. They will definitely help me stretch my comfort zone! I started last year, maybe this year I’ll be able to finish it. 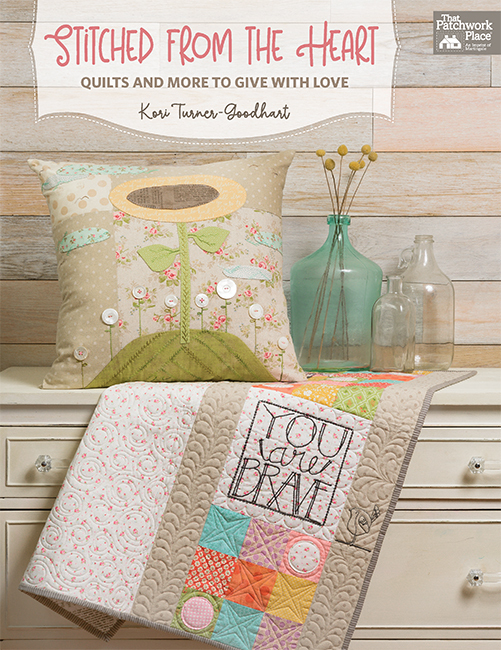 I m really glad you are continuing this sew along with a second sew along and the book! I love being able to follow along with the book! I have quite a few wrinkles–oops, I meqn twinkles! I’ve done 50 then life got in the way. Hope to get back to it soon. In my head at this time. Need the book!!! Wonderful giveaway. I am finishing the Soltice block of the week. Ready to move on with a new project. I am excited to get started on the "twinkle in my eye"!! I just discovered the Splendid sampler and now am ready to have some fun!! Splendid Sampler is just a twinkle in my eye. I managed to miss the first Sampler until it was nearly done. Will get in on this one from the beginning as I really love all the blocks and I’m sure I will learn many new ways to sew. I think I have about half of the blocks finished. It will be fun to sew with you on the blocks not started. I fall in the cata gory of a twinkle in my eye, but this is about to change. You all are so enthusiastic. I want to be a part of this group. Thanks. I have not to started this project. I am feverishly trying to finish a quilt I started last year. But, I do like it and think all the blocks are interesting. I do like to do new things, So, I would not be surprised it I want to start it soon. Currently, I’m trying to finish a few UFOs before starting something new. However, this quilt-along might just pull me in! Thanks for the really wonderful give-away! somewhere along the way – around block 35 i fell off the splendid wagon! Finished 57 blocks so have a topper made and odd one out is label. Hope to quilt it this week. Mine is a little over half way finished. I will complete it by the end of summer. I finally started my sampler a couple of months ago. I spent a whole year trying to decide on fabrics, decision making is not my strong point! I followed along saving patterns and enjoying all of the creativity of the participants. I’m so glad I finally got started and I am having a great time sewing these adorable blocks. This is a twinkle in my eye and a wish on a falling star! Just bought the book and ready to sew. I have a twinkle in my eye, Grandson requested a Minecraft quilt that I am starting on. Never quilted before but have sewed clothes so should not be that hard. Plus I got help from Pinterest for making the Minecraft quilt. But once it is done looking forward to do this quilt. Have a few blocks finished. Then life happened hope to get back to it soon. I haven’t completed the Splendid Sampler but made some blocks from the previous quilt a long. Love seeing what everyone is sewing and their creative additions! Didn’t get to do the sampler but would love to try it. I am reluctant to admit that my Splendid Sampler is just a twinkle in my eye. Would love to have the book in hard copy without having to print each block instructions. I always have some old projects in process and love to start new ones. All blocks and all but 2 bonus blocks are completed! I am in the process of adding the shashing to the blocks according to Jane’s setting design. So excited to see the finished quilt! Thank you Pat, Jane and sponsors!! I am still planning and looking at the wonderful pictures. Happy Creating. Having a whole new group of Splenderettes is so exciting! It’s just what I need to finish my Splendid Sampler. I made 63 blocks before "life happened". It will be so much fun to finish with group support. I have been following along with the pictures but haven’t been able to start it yet. Sadly, it’s still a twinkle in my eye, but I hope to stitch up a few at least once I am feeling better. I love making sampler quilts. It gives me a great way to use my fat quarters! About 2/3 done and in the process of sashing. Following along for the first Splendid Sampler, it was so much fun to see how many different interpretations there were. I’m looking forward to the new creations, too. I am looking forward to starting the Spendid Sampler. Haven’t started yet but am so looking forward to doing so! Just a twinkle i my eye at the moment. My friend has been following along and the quilt is beautiful. Would enjoy the book. "Life" definitely happened to me. I have about a 1/3 of the blocks done. Mine is a USS–unfinished Splendid Sampler. But, I love the blocks I have done, and I look forward to sewing more. I have many blocks done, but I’m excited to jump in and finish the blocks! I started the Splendid Sampler and got behind when I had a total knee replacement that didn’t go very well. I only got about 35 blocks done, so I bought the Splendid sampler book, even though I have a copy of every one of the blocks in a notebook. Would love a signed copy though ;). And I would love to win some of that Auriful thread. Thanks for the giveaway! I have my book and my fabrics. Ready to get these first two blocks made. Hoping to make progress not only in this challenge but all of my others as well. Love you Pat Sloan. You are so inspiring. I had a good intention but it became a twinkle in the eye. I had several sew alongs that started at the same time and I became overwhelmed, and stopped each one. Mine is a decent twinkle. I did manage to complete several blocks and used them to make Christmas gifts, so will have to make them again. I also printed all the patterns and have a folder on my computer with nearly 2000!! examples of my favorite blocks that people completed and posted on the Facebook group. I’m ready to start back at the beginning. Twinkle! Still wondering about the fabric I have chosen and may need to shop for more fabric. I saved all the patterns from the sew-along last year, but I didn’t make any blocks yet. I’m glad to get another chance! I’m twinkling all over the place!! I don’t have the book yet. I’m in traveling mode right now. I should finally go home about June 2nd. Then I plan is to get busy. LOL. Have the book and can’t wait to start. Unfortunately, just a twinkle in my eye! Too busy with college preparing for my son and taking care of my parents who are having health problems. A lot of looking when I have the chance, sadly no sewing. Technically I’m just starting. I did one square and cut out pieces for the second. I hope I can keep up with the challenge! When I sew all the blocks I’ll be getting experience in sewing all different shapes and types of seams. I can’t wait to start. Another chance to make this splendid quilt! Just a twinkle. Tried to print patterns but could never get them to come across on printer. Glad to start again. Thank you for the chance to make this wonderful quilt again. Maybe I will get it done finally! This would be a great addition to my quilts. I see so many beautiful patterns that I want to make,but I could never do that many quilts. This sampler would be the solution. What a great prize. I have completed some of the blocks and am making a wallhanging out of them…. I finished the top on 2 Splendid Samplers. One scrappy batiks and one made from "black tie affair". I think I will do another with my favorite blocks with a different setting. Maybe Red and white! I am just about to get started! Just a twinkle in my eye. This is just a twinkle in my eye. I’ve never done a sampler before. First time for everything! This looks like a fun project. Would love to win! I am among those who have started bot got stalled along the way. Thanks for the encouragement to continue. I have not started a Splendid Sampler quilt, but I love watching all the different blocks, I watched closely last year! I am among those who have not got the first one finished. Hoping too finish this time. Thanks for the encouragement. What a glorious book! This is the first I’ve seen it and would love to spend hours with it! I’ll have to put it on my wish list for sure. My Splendid Sampler is stalled about 3/4 way along. SO hopefully this will get me back on track. Wonderful blocks. And it is going to be more than 1 quilt. The patterns are ready whenever I am…the blocks are still in process. Just a twinkle in the eye of my sewing needle! I’m plugging away on my quilt. Thanks for the give away. I would love to get a copy of the Splendid Sampler book as I would love to participate in this this sew along again. I didn’t finish the first time because I was working so much, and I put all the paper piecing and hand embroidery blocks off because they were more time consuming. I finished all 100 blocks and am now putting my first of two quilts together. I am going to be hanging around to remake some blocks and turn them into table toppers, wallhangings and table runners. I also love all the learning I get from working with a different group of people! I missed it the first time around, but LOVE the quilt! Let’s go!! Just a twinkle right now. But the more I see it, the more I want to make it. I have three of four more blocks to go, plus I’m working on two colorways (2 quilts). I will sash them differently. I joined the Splendid Sampler last year and managed to keep up for most of the year. I fell behind initially because of the embroidery blacks and then more because of applique blocks but did pretty well with the pieced blocks. There are some I want to do over, using the skills I picked up along the way. Then the challenge will be deciding if/how to sash and border and quilt it! It is a twinkle in my eye. I did follow along watching everyone’s progress though. I’m one of the started-last-year-and-not-yet-finished gang! very exciting for me – new to quilting and I would love to learn how to make your patterns!! I have thirty-one blocks completed and hope to finish my quilt by May of next year. I finished about 80 blocks and plan to finish. Started off strong. I did the first…..two…and then got sidetracked. I’m so inspired by the finished Splendid Samplers – I can wait to finish mine. This reboot was just what I need. A twinkle in the eye. I liked many of the blocks I looked at last year, but have not actually sewn anything. Just a twinkle in my eye, but I can’t wait to get started. I started the first time around – but only completed 10 blocks. Looking forward to re-starting! I am just beginning, I bought the book, now I’m ready to start. Splendid Sampler is such a great quilt. I have enjoyed following the emails all year and following along on Facebook. I dutifully printed off all the patterns, put them in sleeves and into a box to keep them together; then I misplaced the box…would love to win. I have "curated" my fabrics & I’m starting to decide which fabrics to use for dinner of the blocks. My machine is not set up right now, so I’m focused of the blocks that can be done by hand. For the other blocks that I love, I’m pulling & cutting fabric. I’m excited to have a chance to see along with more virtual quilty friends! Hi – already finished my 100 block "Splendid Sampler" and still working on bonus blocks which I am making into wallhangings. Loved the journey and so happy to see more splenderettes joining in. Good luck to everyone. I’m a pastry chef and worked a long day. I haven’t started yet, Its a twinkle in my eye. Trying to finish what is already started. too many UFO’s. I spent the day decorating 9 dozen cupcakes for a wedding. Have three pieced, but need to do some hand work on two of them and need to do some ripping on the third. I am looking forward to this journey and seeing everyone’s blocks! Happy sewing! Right not it is just a twinkle in my eye. My Sampler quilt is still a twinkle in my eye!! I did a couple blocks then got side tracked! I found the SS 3 weeks before the first round finished. I started anyway and have almost 20 blocks done. So glad to have people to sew along with! I made 30 blocks the first time. Especially enjoyed making the appliqué blocks! I am excited and have already started on some of the blocks. I have invited my sisters and my Mom to join along! I am searching for books for all of us. Luckily, I had already bought one, and won one, so now I only need two more! I am also going to see if anyone in my quilt classes I go to would like to join along! Just interested in starting. Love the Winter Solstice blocks. I followed along all last year every week, but sadly didn’t keep up. So I’m one of those who will be giving it another go. I am determined to do this. Twinkle in my eye but printed all the blocks! Hope to get some done this summer as September I will be busy Co-chairing our guild Quilt Show in late Oct this year! Definitely twinkling!!! Maybe this time I will get it done. Just ordered the book, getting download, wooo hooo. I have my fabric all picked out, just waiting for the weekend to start. Waiting on book. Thanks for a new start. This looks like a really fun book! On my to do list! I am a starter on this book! A twinkle in my eye! A twinkle in my eye. It looks so inviting! I have made 7 blocks. How do I know what blocks are you doing? Right now just a twinkle in my eye, but I’m ready to start now. I started when the first day the first go around. I made 12 blocks and then was given my 5 month on gran daughter and making her life better became my first priority. I am starting back up with this go around since I have her all settled in. The sampler is still a twinkle in my eye. I did start the sampler but fell behind. Hopefully, now that I have the book and we are assigned specific blocks, I will continue. The quilt is so pretty and one I truly want to finish. It’s still a twinkle in my eye, sadly! I have several blocks completed, but have a lot to do yet, so I guess the completed top is a "twinkle in my eye" for now. It’s still a twinkle in my eye, but it is a fascinating project. I have only just begun this journey. I’ve completed about 13 so far. They are all so unique, like mini quilts. I’m so glad I found this project. I got about 75 blocks done, need to finish the remainder. It’s so nice to know that I’m not the only one who got side tracked! The Sampler is "just a twinkle in my eye" but have followed it all last year and collected all the blocks! I finished all the blocks and am putting together my first quilt. Now I’m back to make more of my favorite blocks for additional technique practice. I will make some decorating items out of the new ones. This was the best quilting experience I could have ever had. This will be a chance for me to sample a lot of new techniques. Huge commitment for me, hope the challenge will keep me going. Hi all, am a total novice at quilting. The past year I have been searching everywhere to see how to do patchwork and quilting. I bumped into Alyssa Thomas youtube videos and from there I afiliated myself to the page of The Splendid Sampler. It is still so exciting to look out for the mistery block every Thursday And Sunday. Well I got the Splendid Sampler into me. Since then I am trying to buy the stuff to getting set up. Did by now my sewing space and finally have bought my sewingmachine. Would like to have the aurifill threads and also the book to complete it all. Thank you for starting up this venture of patchworking and quilting Pat and Jane. Am living on an island in the Caribbean and getting to all the stuff needed is kind of hard but not impossible. So far it is a twinkle in my eye. I just might give it a try this time. I love the quilt. Haven’t started, but it looks like fun! Just a twinkle, but it looks like fun! The Splendid Sampler quilt has been a ‘twinkle in my eye’ but I’m itchy to start a new project and have fabrics in mind. It is just a twinkle in my eye. But, looking forward to working on it. As of now, it;s just a twinkle in my eye. Have been waiting for the book. Can’t wait. Just a twinkle in my eye, waiting to get the sampler book. Going to download the book and start so I can use up some of this material I’ve accumulated over almost forty years of quilting. Right now it’s a twinkle. Would love to have the book! I love all the sewing theme ones and had hopes of doing them. It is fun to do sew along, it keeps me working on them. thanks for the ideas. Wanted to participate last year but life three us a couple HUGE curves! So this year I hope to get going on these blocks and have enough to put my quilt. Still a twinkle, although the blocks look lovely together. I am now working part time, so this is my opportunity to commit to a larger project than I’ve created in the past. I need that beautiful book! Just a twinkle in my eye. I downloaded most of them last time but just never got started. This might be just the inspiration/motivation I need. Thanks for the opporunity to win such great prizes. So excited to be able to do the Splendid Sampler this time. Was traveling before and couldn’t participate! Yippee! I am hooked on the concept and the lovely blocks. Don’t have the book yet, will order it as it appears to be a great way to use up my lovely collection of scraps. Would be the perfect inspiration to get me piecing again! I’m setting my blocks together. Love this Splendid Sampler! I love the size of the blocks, versatility and friendship! Just fun! fun!! Fun!!! Just a twinkle in my eye. I’m trying to quilt Pat’s My Garden Party before I start another project. If I don’t get my book soon (it’s been back ordered from who knows where now!) I probably won’t get to doing it. I don’t understand why it was back ordered, maybe THEY just didn’t order enough? Grrr…. I really dislike always being the last one! I started but had to stop due to life events. It would be great to finish the project. I am jealous of some of the beautiful quilts! The Splendid Sampler is definitely a twinkle in my eye. Have a large quilt on the go for a gift … then plan to get things started. The blocks all look so interesting, such a variety to say nothing of quilt skill-building! So many blocks to choose from. Beautiful book. My splendid sampler is a work in progress. Love all the helps and encouragement from Pat, Jane and others. You all are an inspiration. My Splendid Sampler is just a twinkle in my eye. But what a glorious plan! I am just in the starting stage. Somewhere along the way! I started and managed to keep up for about 6 weeks, then life happened and I fell behind. And once I fell behind, it was too hard to jump back in. Maybe this time I will finish! I finished all 100 blocks and put them into rows. Just need the sashing and then off to be quilted! It’s been a blast! My Splendid Sampler is just a twinkle in the eye stage. I just joined the group yesterday, (thank you Karen Cole for the suggestion), and I ordered My Splendid Sampler today. Can’t wait to get started!! I would love to sew this Sampler. Have you given away the book yet? I’d love to win! This quilt is a twinkle in my eye. I love seeing everyone’s blocks. I had the best of intentions last year but the sampler remains just a twinkle in my eye. Maybe this time. I’m ready to take up the challenge and start again with a better selection of fabric suited to six inch blocks. Just a twinkle in my eye. Been following along and keep getting drawn back! Love the blocks and enjoy seeing the different fabric combinations. I’m brand new to this sa,please of I guess I twinkling! Just a twinkle in my eye – I came in towards the end but have enjoyed everyone’s quilts. Started last year and life got in the way. I appreciate this new beginning. Hopefully will get my Sampler finished this time. Thank you Pat and Jane for a fun quilt! I started with the first group, made some blocks when I could find time, but life interfered. I’m still working on blocks and am so glad you’ve begun another sew along! I WILL finish this project! I have truly enjoyed seeing how creative people are, turning each block into something personal. Thank you so much to Pat and Jane and all of the contributors. It’s a twinkle in my eye-I have family wedding quilts to make this summer, no time now. I started last year, monitored all the wonderful block designs aNd only made a few. Life is busy. My goal is to make many more this year! I am ready to get sewing! Twinkle in my eye, but I’m eager to do a monochromatic sampler! I am enjoying learning about numerous block via the Splendid Sampler Book. I’ve all the blocks on my pc but did not have the time to start yet because of another sew along. I hope to start this summer. Still new to quilting, so this is just a twinkle in my eye. Thanks for the generous giveaway. Just a twinkle… hoping someone orders the book for my birthday! My Splendid Sampler is still a twinkle in my eye, but I and encouraged to get back to it now! I love working on the Splendid Sampler which is a work in progress. I call it my happy quilt since I enjoy working on all the different blocks. Thanks. I am just getting started! I am really excited even though I have 25-ish projects already going!! I am 15 blocks in and then life got in the way! So glad to jump start this project again. Thanks so much! Just a Twinkle…but would love to start. It’s a twinkle in my eye. Just a twinkle in my eye..lots of fabric stashing going on here and just beginning to organize. Progressing tho! Thank you. I only did a few blocks during the QAL, looking forward to going along now. It is just a twinkle for me. I hope to get started soon but am finishing up projects to give to other people so I am anxious to do something for me. I’m behind, I’m behind, I’m behind. The faster I delay, the behinder I get! 🙂 Thanks for another chance to sew along with y’all! I got to block 30 or so, still have the fabric set aside, but life got in the way. I hope to finish one day soon. Just purchased the fabrics. Can’t wait to get started! Mine quilt is about 10 blocks shy of finishing. My hubby likes to say about a stalled project: "All it lacks is finishing up!" 😉 Meanwhile, there’s life to do. At this point it’s only a twinkle in my eye. Have a few other projects to finish first and have started collecting fabric. I just joined last month & was in awe of the Fabulous designs contributed & the wonderful quilts everyone was making. I just started & made my first block by Pat A Sloan, Hearts a Flutter. Working on Jane Davidsons Wings now. It’s just a twinkle right now. My wife has been sewing for years and just got me interested and so it’s something we can do together!